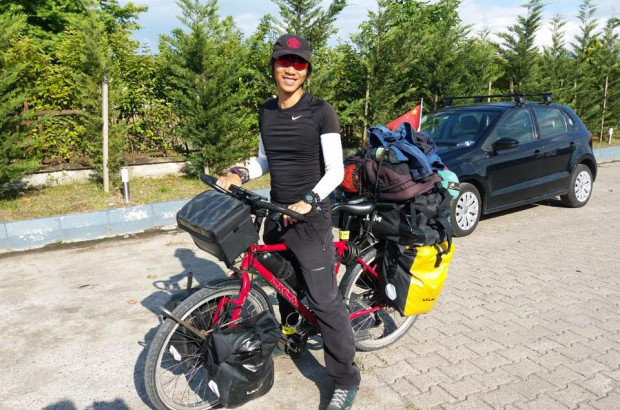 He spent 20 months cycling 15,000 kilometres from Shanghai, headed to Paris. And where did his bike get stolen? Brussels South Station. A Facebook post by JJ Lue has received hundreds of comments and been shared across pages and profiles. Writing in English and French, he describes his journey and the loss of his bike. Though many Brussels residents have jumped in to offer him a bike or to help fund a new one, Lu says that he wants to complete the journey on his bright red LKLM 318 series if possible. He reported the theft to the police but said that “the efficiency of the police does not seem to be high”. Anyone who has seen the bike is asked to contact Lu via Facebook. Good idea. Insult the cops from whom you want help and cooperation. Especially since you refuse replacement bikes from generous people. And as for the visa expiring, it would have expired regardless. Sounds fishy to me. Tourists should be warned about the dangers/risks around the Brussels South area. And the police not finding the culprits is hardly news. Anons: how would you go about finding an unregistered stolen bicycle? What are these dangers/risks overwhelming the south station area? Police will not even try to find the bike and they are quite open about it. At least that was my case, when my bike was stolen from my own garage. It was a targeted action - nothing else was stolen, just one bike. Police told me to wait two weeks by which time I will receive a report confirming that the perpetrators are not to be found (it was not conditional). So most likely the guy was told the same - we will not try to find your bike, all we can do for you is to issue a report for your insurance, but even for that you have to wait x amount of time as only then we can officially confirm that we couldn't find it. For someone in his situation that is understandably a bit frustrating. Mark, again I ask, how does one find a stolen bicycle except by a stroke of very good fortune? That's the point - one can try to increase the odds by asking around on the Internets. Chances are better than via police for sure.